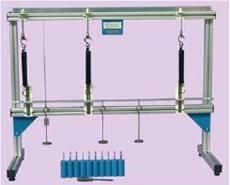 Bench-top, standalone, to investigate the behaviour of a continuous beam under various loading conditions. Rigid frame with 1m scale, 1mm divisions. Three Support brackets with spring balances with fine adjusters. Loaded by 3 hangers and weights. Uniformly distributed loads can be used in the form of hook-weights set.